The primary topic of course is relational evangelism, and the idea of forming “strategic friendships with non believer’s” with the goal of helping them become fully devoted followers of Christ. training in being able to clearly communicate a gospel script. I read evangelism books for a living, and many focus on just one of those three. Close Proximity centers on forming relationships of integrity. I can testify from my workshops that many lifelong Christians have no irreligious friends and don’t even know how to befriend a non-church goer. Hybels and Mittelberg give the reader several practical steps to form relationships with non-Christians. High Potency centers on living a holy life – a life that demonstrates the work of God, and a life that bears witness to the truth within us. Clear Communication calls us to share the gospel with words. This book doesn’t teach that you life is the only witness you need. Instead the authors remind us that we need to communicate the gospel with words as well. Maximum Impact is all about how to help a person become follower of Jesus. Some who read this book claim that it presents a “man centered” form of evangelism and minimizes the work of the Holy Spirit. However, being familiar with Hybels’ writing and teaching, this critique holds no water. Hybels clearly speaks of the role of the Holy Spirit in evangelism. He tells stories where he feels the nudge of the Holy Spirit. These quotes also go to show that Hybels knows that the Holy Spirit has an active role in evangelism. Wherever there’s high savor, close interaction, and a straightforward presentation of truth, and where the Holy Spirit is active, there is contagious Christian influence that might lead, eventually, to the salvation of one more lost person who matters deeply to God. What’s holding us back? We have the Holy Spirit, we have the Word of God, and we have the church. 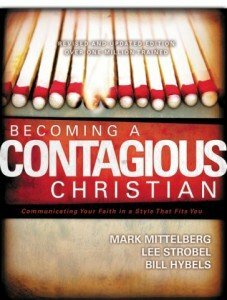 We want to be contagious Christians, don’t we? Then let’s be real with people. It’s important to ask God for guidance in choosing the names. And you need to keep talking to Him about them, asking the Holy Spirit to open them up to the love and truth of Christ. Keep in mind that the Holy Spirit wants to be your unseen partner in reaching your friends, family members, coworkers, and neighbors with Christ’s life-giving gospel message. Acting on what seemed to be a prompting from the Holy Spirit, he told her quietly that he was going to pray for her, right there at the restaurant’s front counter. If you think this approach is for you, ask the Holy Spirit to guide you to know how, when, and where to direct your words and challenges, as well as the wisdom you’ll need to do it with an appropriate mix of grace and truth. Then I try to discern whether the person seems at all open, and I pray quickly to see how the Holy Spirit might be leading. Your journey may not be as dramatic, but it can have a life-changing impact for someone standing a few steps away from you—and for you as well, as you learn the power of extending care, compassion, and inclusiveness under the guidance of the Holy Spirit. Another common critique is that it is relational evangelism. Most of these critiques come from the viewpoint that one doesn’t need to build a relationship first before the gospel is shared. If you are a fan of the urgent confrontational style of evangelism, for example, Way of the Master, then this material will bother you because of its emphasis on building relationships and earning the right to be heard. If your church doesn’t believe in engaging the culture and having relationships with non-churched people, then this book will be so against the grain of your church’s DNA that it won’t work period [there are some very separatist type churches out there]. The final critique I see most often is that this book is not theological enough. If you want a theology behind evangelism, then I agree – this book is not oriented in that way. It is extremely practical in how to talk with people, how to be genuine with people, and how to have spiritual conversation. This wasn’t written as theology book, nor does it pretend to be one. If you haven’t read this book yet, then you have missed out. Order your copy of Becoming a Contagious Christian, from Amazon and I’ll get a few nickels. Hi there I did not save a copy of my order to my hard drive for reference and the link has expired.